eliteHRMS is a holistic HRMS that helps companies manage employees and their data in an effective and efficient manner. The solution has been tested across different verticals IT/ITES, Production, Food and beverage industries, etc. The solution is aimed at serving the HR of an organization in managing the various activities pertaining to managing employees starting from hiring them till their retirement/exit. The solution has the core goal to fit with the corresponding industries without or less customization. It provides end to end HR Operations with huge cost benefits for the organization. In a decade of HR Functions taking the reports from the HR Applications is the very big headache for the HR’s. On a daily basis HR needs at least 2 to 3 reports from the HR applications because of the necessity and needs are very high with all the Company and audit activities. System providing any solution and resolving pain in the last decade is very less i.e HR can get the reports 25% - 30% of reports by automated process but still the gap is very high to get the HR needs. We are much keen on this to provide the best quality of report builder operations in our eliteHRMS to shorten the HR needs. HR can take the reports quickly by the self configuration of each and every reports. Also HR can store save the reports as template to use the same reports for the future needs. We are providing the very useful system for the Payroll/Finance users. Normally doing the payroll process for the companies is little bit tricky when the employees strength goes little higher. Though we have very good process or human resource in the correct place also, many times we can have some works which are all always ambiguous. Whenever we are doing the ambiguous work we are losing the time and space. To avoid this we need the system which will resolve their problems. When management thinks to resolute the problem they have the option to invest some amount to purchase the good products to automate their activities. But now a days we can get the systems against the prices. The system providing the operations 100% to the Payroll/Finance User, will not resolve and saves the time only 40 to 50 %. If the system provides the user usability into 80 % Comfort, it will make the life simpler and makes them to increase their productivity of their management. So if you want to improve the productivity and smarter investment, try with eliteHRMS. It will provide the process learn, understand, work Smarter & Quick. We have a trendy and powerful ESS & MSS services which are integrated with the system. And it provides the Operations user-friendly and also the employees' can get resolution to their needs and queries with the single panel. System will provide the flexibility to set the simple / moderate / very huge complex of leave process and attendance process with the companies it lies under the single settings to manage the process. Some of the core features of the process is as below,Employee Post Leave’s or cancel or re change attendance to raise to their surrogates for the approvals. Employees' can see their Pay slips & Income Tax Workings also to do the declarations from the ESS service. Employees' can raise the claims or post their comments on the polling when anything is raised. Also Employee has the interactive chat facility to do the chats with the limited group facility. ESS has the salient feature of the Forums and KT Store. Employees' can post / view / review their feedbacks and comments on the process. Managers has the operations of approvals of each and every process and they can generate the reports for the team and track the employee performance on the desired way. eliteHRMS Mobile service provides the user to do the approvals in the Management services.. Mobile or Tab to monitor the entire operations in a single arm.i.e Approve Claims by clicking Approve Leaves & Attendance, view the pictorial representation of the management reports by clicking on Review Kaizen or GFTP to land the info’s to the management to resolve the issues or thoughts with quick stands. eliteHRMS Payroll Presentation. 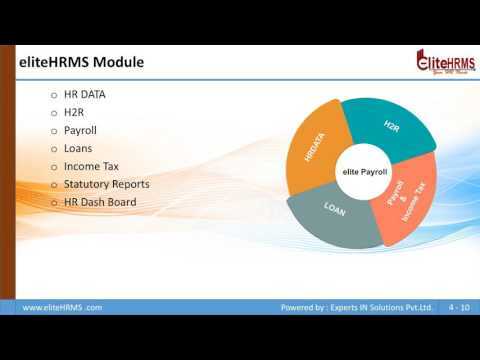 This video presents the features and modules of eliteHRMS on Payroll. Q. What kind of reports can I take from eliteHRMS? Do these reports cover all the permutation combination? eliteHRMS provides dynamic reports satisfying all the requirements in pdf and excel formats. Q. Does eliteHRMS cover the Employee Life cycle activities? Yes, eliteHRMS cover the Employee Life cycle activities. Q. Does eliteHRMS have upload provision when employee information are in bulk? Yes, eliteHRMS have upload provision when employee information are in bulk. Q. Is eliteHRMS having the functionality to migrate the existing system information easily as upload or it involves any complex process? Yes, eliteHRMS offers simple process to migrate the information from existing system. Q. Who are your customers and how long they have been using eliteHRMS? Some of our customers are Sampoorna Catering Services, Mazaak Motors, Toranna Motors, Supreme Consultancy, Vernal Soft, Annai Dates and many others.